It's 08:30 in the morning and muscular workers are unloading trucks full of boxes marked "Fragile", clothes wrapped in tissue paper with "New collection, 2015" written on the hangers are being carried into the exhibition centre, and young women in miniskirts and stilettos are rushing around getting things organised. But when church bells chime the hour and the doors open, we enter what some might take to be a priest's version of Heaven, filled with life-size statues of Mary, every possible type of holy water sprinklers and the very latest collection of cassocks and tunics. Once every two years Catholic clergy from the four corners of the world come to Vicenza to buy church supplies, learn how to enhance their liturgy or just to renew their wardrobe. Father Pasquale has travelled 13 hours by train from his parish in Calabria to check the new trends in sacred merchandise. With a little pad and a camera, he roams around the 15,000 sq m of the fair, furiously taking pictures. He doesn't have much time - he has to catch the train home in a few hours to report back to local chaplains. "I wouldn't miss this fair for anything in the world," he says. "It's a bit of a hassle, that's for sure, as I spend more time on a train than anything else, but it's important for us - humble priests in southern Italy - to see how the Catholic church develops, what's new in terms of technology that would make our lives easier and to check what priests from big cities wear and how they perform the liturgy." Other parishes in Calabria chipped in to cover his travel expenses, and he tries to get the best deals. Father Pasquale suddenly stops and wonders in front of a stand that displays light blue vestments embossed in silk velvet and gold laminated prints, his eyes filled with amazement and joy. He reaches to feel the fabric with his fingertips and hums with delight. "You have Armani, Gucci or Prada," he says. "This is our version of haute couture." The stand belongs to the Bianchetti family, Italy's leading supplier of ecclesiastical clothing - its clothes, the joke goes, are prete-a-porter, a pun on the Italian for "priest" and the French for "ready to wear". The head of the company, Elisabetta Bianchetti, personally designs and produces each and every vestment in the collection. "Through the years we have manufactured pieces of clothing for three Popes: John Paul II, Benedict XVI and now Pope Francis," she says. Meanwhile, her daughter talks Father Pasquale through the 2015 collection, which was apparently inspired by 1960s fashions. "We are always in search of new inspirations that will drive sacred fashion forward," she says. Ecclesiastical clothing in Italy is a £18m ($27.4m) annual business, but Bianchetti's vestments do not suit every budget with prices for a tunic ranging from £400 to £1,300 ($600 to $2,000). The Bianchettis say they clothe "top clergymen from around the world", who want the best - a combination of tradition and "original Italian fashion". 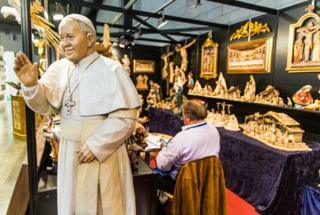 During his tour, Father Pasquale stops a couple of times at a stand that sells devotional candles. "They look like normal candles from afar and they are made of wax but, to my surprise, they are powered by electricity," he says. The producer, Danilo De Gaspari, came up with this idea for his parish near Milan a couple of years ago and now he's exporting his product around the world, to countries such as India and Brazil. Others, from India and the US, are placing orders. "We can set the candles' timer to 20 seconds so the parish in my home town can make a little money out of it and we can finally afford to renovate the house of worship," says Labham Sogani, a trader visiting from Delhi. The overall religious goods business in Italy is estimated to be worth something like £3.4bn ($5.2bn) - more than the country earns from exporting wine. And a year-long "extraordinary jubilee" called by Pope Francis, which is due to start in December, provides opportunities for growth. As I talk to religious merchandise businessman Rocco Ascione, we are frequently interrupted by the ringing of his mobile phone. "They constantly call me from various shops in Rome, they place orders every waking hour because they're afraid to run out of Pope fridge magnets or pens with the image of the Holy Mary when the chaos begins," he says. The Vatican will be visited by millions of pilgrims during the jubilee year and like any businessman, Ascione wants to capitalise on this opportunity. "Worshippers would spend any amount of money for a Jubilee souvenir," he says. "It's a business like any other, but this is more special: this is blessed by God."